Frontier Airlines is in the midst of several network changes designed to aid its transition to becoming an ultra low-cost airline, and in the process appears to be challenging its headquarters Denver International Airport for what the airline perceives as operating charges that are rising faster than other major airports in the US. The airline is eliminating numerous markets from Denver, mostly smaller routes that generate higher cost connecting passengers. Even as Frontier declares that higher airport costs make connecting traffic unprofitable for the airline, those markets were arguably not a good fit with the network Frontier is trying to create as it works to complete its business model transition. Frontier is also opting to acquire larger gauge Airbus narrowbodies, a trend being adopted by major and low-cost airlines alike to drive down unit costs. All the moves Frontier is making show that the there are more chapters ot be written in its quest to attain ULCC status. At times throughout the last few years, Frontier has moved to diversify outside of Denver as Southwest grew its presence at the airport, offering a formidable competitive challenge to Frontier. But even as Frontier added Trenton, New Jersey as a base and attempted to operate a base at Colorado Springs, Denver remained its largest base, and the airport maintains that status within Frontier’s network by a wide margin. As Frontier works to cut its costs to ULCC levels, (Spirit’s unit costs excluding fuel and special items for the 9M ending Sep-2014 were USD5.92 cents), its network profile is also changing, and operating service to markets more suited to aircraft smaller than its Airbus narrowbodies becomes more cost prohibitive. Starting in late 2014 and continuing through Apr-2014, Frontier is eliminating roughly 20 routes from its largest base in Denver: Eugene, Oregon; Fort Lauderdale, Florida; Bakersfield, California; New York LaGuardia; Idaho Falls, Idaho; Harrisburg, Pennsylvania; Spokane, Washington; Bloomington, Illinois; Chicago Midway; Minot, North Dakota; Newport News, Virginia; Palm Springs, California; Santa Barbara, California; Oklahoma City, Oklahoma; Fargo, North Dakota; Branson, Missouri; Bellingham, Washington; Jackson Hole, Wyoming; and Great Falls, Montana. Most of the markets are small, and many are operated by United with smaller regional jets, presumably to connect to larger markets through United’s hub in Denver. Frontier is also cutting service to some larger markets including New York LaGuardia and Chicago Midway. But the Midway cuts are in light of Frontier’s decision to operate service from O’Hare to Denver. United, Delta and Southwest all offer service from Denver to LaGuardia, so it looks as if Frontier is using the slot to operate service from New York to Miami. In a recent communication to employees, Frontier CEO David Siegel explained that in order to reduce its costs further, Frontier needs to “decrease our exposure to high costs, low revenue connecting passengers – all of which is driving the reallocation of aircraft into new markets”. During the winter 2014/2015 timeframe Frontier is adding flights from West Palm Beach to Denver, Trenton and Washington Dulles, Orlando to Atlanta, Chicago O’Hare and Milwaukee, Milwaukee to Fort Myers, St Louis to Fort Lauderdale, Trenton to Nassau, Philadelphia to Tampa and Orlando and Miami to Dulles, Denver, LaGuardia and Chicago O’Hare. 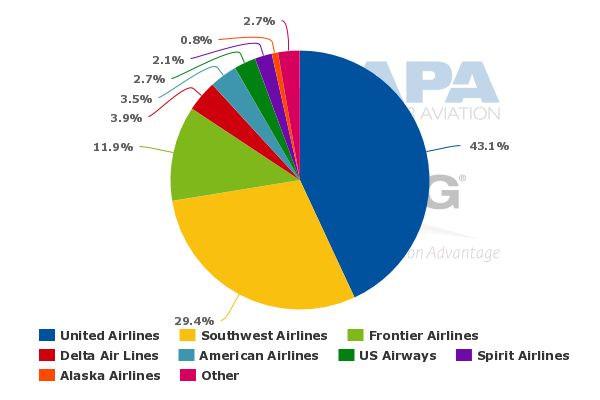 Based on current schedules from CAPA, and OAG for the week of 1-Dec-2014 to 7-Dec-2014, Frontier is the third largest airline in Denver based on seat deployment, with a 16% share. 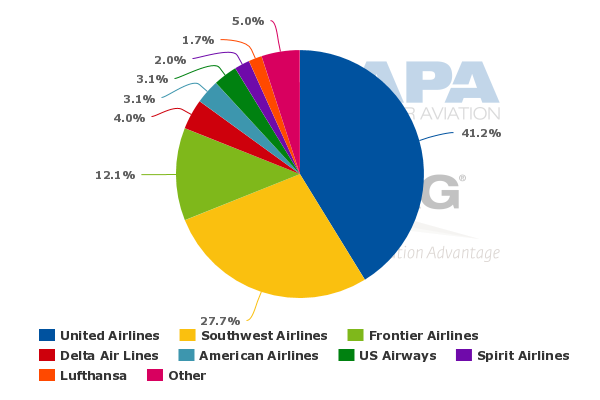 The airline’s share in Denver measured by ASMs is 15%. Once some of Frontier’s planned cuts in Denver are in place, its seat share in Denver is projected to fall to 12% for the week of 2-Feb-2015 to 8-Feb-2015. 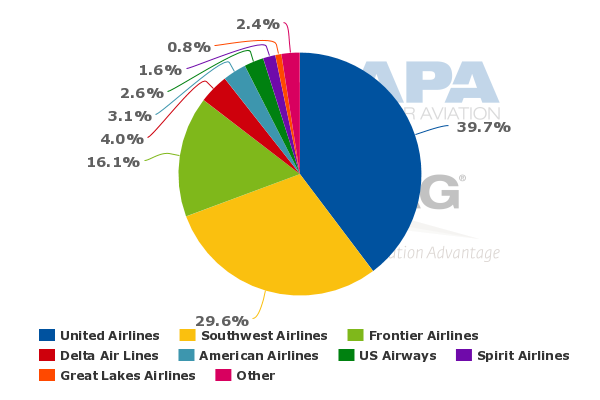 Frontier's share of ASMs at the airport will also drop to 12%. Even as those markets make little sense for Frontier as an ultra low-cost airline, the company is attributing some of its pull-down in Denver to the airport’s higher operating costs. Mr Siegel said Frontier needed to right size its operation in Denver ahead of signing a new lease with the airport in CY2016. He argued that airport landing fees have risen 30% during the past three years. Local news outlet The Denver Post reported that Mr Siegel’s remarks could be a negotiating tactic as lease renewal discussions commence. The newspaper highlighted a recent deal that the airport struck with its largest tenant United Airlines included the elimination of some passenger traffic goals, and agreeing to take back unleased space in exchange for United committing to maintain 9% of its system capacity at the airport through 2025. The airport also agreed to restructure bond debt, which if approved by the city council would save airlines serving the airport USD45 million, with the bulk – USD35 million – passed on to United, according to the paper. Obviously, Denver International Airport has its own view on Mr Siegel’s conclusions. In response to Frontier’s estimated rise in landing fees, Denver Mayor Michael Hancock in a letter to Mr Siegel published by The Denver Post observed that landing fees are largely influenced by the number and weight of aircraft. “The landed weight has decreased significantly as you and other airlines shift to fewer aircraft with higher load factors,” said Mr Hancock. He stressed the airport’s cost per passenger remains competitive, and is in the mid range of overall costs compared with other large airports. Denver’s mayor also highlighted that the city has opted to exempt aircraft parts from a 3.62% sales tax. The move by Frontier to make public its frustration with what it claims as higher costs at Denver International is perhaps both an opening salvo in lease negotiations and a method of reinforcing its commitment to transform itself into an ultra low-cost airline. As Denver’s third largest airline, Frontier does have some leverage in the negotiations; however, under the ownership of Republic Airways Holdings Frontier briefly moved its headquarters to Indianapolis, and it is not clear how strong a commitment Frontier’s new owners Indigo partners have to Denver. But it would obviously be difficult for Frontier to uproot its largest base and equally tough for Denver to endure a significant pull-down by its third largest airline. So it seems each side for the moment is posturing as tough lease negotiations get under way. At the same time Frontier is positioning itself for the onset of lease negotiations with Denver International Airport, the airline is also opting to order nine Airbus A321s, the largest aircraft in Airbus' current engine option narrowbody family. Presently, the 138-seat Airbus A319 comprises the bulk of Frontier’s 55 aircraft fleet. The airline operates 35 of the smaller narrowbodies and 20 168-seat Airbus A320s. 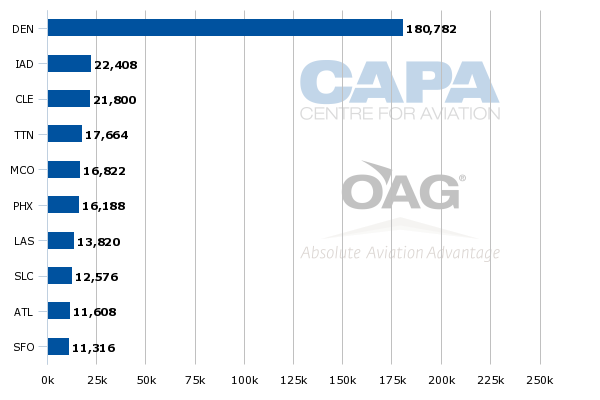 It has 62 A320neos on order in addition to 18 A319neos. Frontier is exhibiting a certain level of confidence by opting to publicly air its frustration with Denver’s higher costs ahead of lease renegotiations. Perhaps that confidence is fuelled by its efforts to lower its own costs, and the need to keep its costs in line with other ULCCs in order for its new business model to have staying power. It is a different scenario than Spirit has faced in its ULCC evolution. Despite a significant domestic push during the past few years, Fort Lauderdale remains its largest base and headquarters, and the airport is known for its attractive operating costs versus nearby Miami. 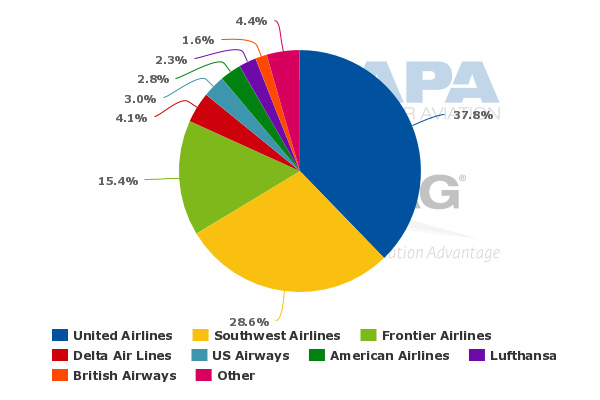 But Spirit also spreads itself more widely, with substantial operations also at DFW, Chicago O'Hare, Las Vegas and Detroit. That is just one of the many differences between Frontier and Spirit, who are setting the stage to encounter one another more often in the not too distant future. Perhaps Frontier believes its current posturing with Denver International is necessary in order to ensure it competes with Spirit on a level playing field.